The theme of the first Congress held in 2010 in Bangkok was focused on ‘Issues and Solutions’. 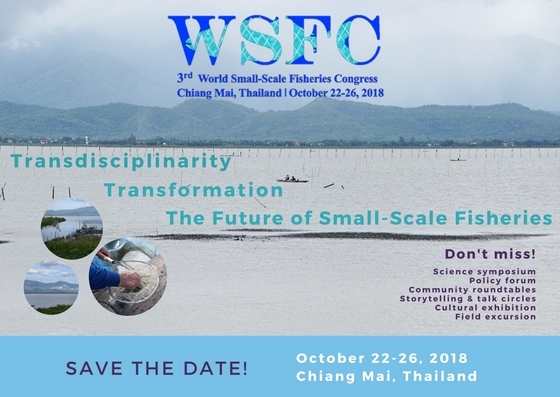 The 2nd World Small-Scale Fisheries Congress explored 'Options and Opportunities for Small-Scale Fisheries'. Recognizing the need for innovation in all aspects concerning small-scale fisheries, including social transformation and governance reform, in order to protect the rights of small-scale fishing people and to promote sustainable and viable small-scale fisheries, the third congress will focus on 'Transdisciplinarity and Transformation'. You can reach us at 3wsfcongress@gmail.com or visit the congress website. As is the past, every effort will be made to make the congress accessible and interesting to fishers, fishers’ organizations, community groups, students and early career scientists. The main theme for the congress is 'Transdisciplinarity and Transformation for the Future of Small-Scale Fisheries'. The congress will facilitate interaction, information sharing, cross-fertilization of ideas and networking opportunities for participants. Thus, it will follow a dynamic format with activities organized around five theme days: science, community, policy, field, and action.